You love your pet and want them to be happy and rested. 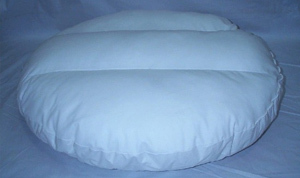 They will be when you get them warm and comfortable Royal Pillow Down and Feather filled Dog Bed (we also make a more affordable Dog Beds and line of Pet Beds using polyester filled inserts). 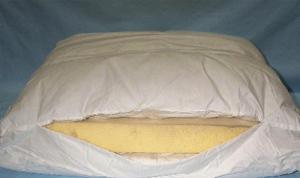 Royal Pillow constructs all of its Dog Beds in the same manner as the custom pillow and cushion inserts we produce for our high-end furniture clients. This means that your Dog or Pet Bed will look wonderful, be comfortable and can last for years! 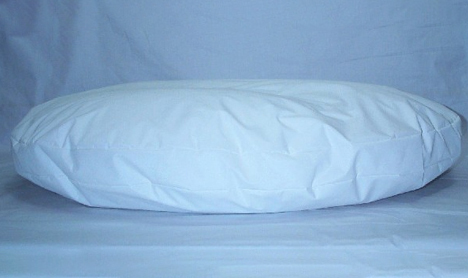 We offer Dog and Pet Beds in several styles, sizes and with a wide range of polyester/feather/down fill. We can also make a custom sized bed for your dog or pet for a cover you may already own, or to fit for your dog house. Remember, we are a manufacturer and offer factory direct wholesale savings to you! We list numerous Dog and Pet Bed sizes, shapes and fill combinations, however, if you do require a size that’s not listed, please E-mail us, or call us toll free at: 866-Pillow1 (745-5691) Just give us your dimensions and we will be happy to provide you with a quote. CONSTRUCTION STYLE TYPE I – Band all around Dog Bed with Inner Channels. Instead of a knife edge, we use a band all around (2” to 4″ band) to make the Dog bed thicker. We also use inner channel construction to keep the fill evenly distributed at all times. The compartments are filled with your choice of polyester fiber, or various blends of FEATHERS/DOWN, including 100% DOWN. Your Dog or pet can really “sink” into these beds. 30% Down / 70% Feathers Dog Beds/Pet Beds – This fill is a significant step above the 10%/90% blend, and consist of 30% down and 70%feathers (very small feathers). Quality, durability, and comfort makes these bed a superb value, and as with all down/feather products, your pet will have the “warm” and “cozy” feel that only feathers can provide…your pet will love it. 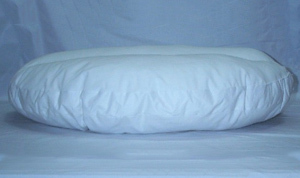 100% Down 600+ Dog Beds/Pet Beds – These are filled with 100% White Goose down (minimum 600+ fill power), this means NO feather stems (only the Down), providing the ultimate in loft, for an unparallel feel, comfort, and warmth for your pet. We also offer 700+ and 800+ fill power Hungarian Down, call us for prices. 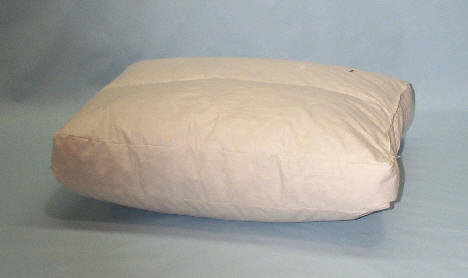 We offer two standard (large) sizes in the fill on top/foam on bottom construction style. Please call for custom sizes. 10% Down/ 90% Feathers Dog Beds (with FOAM) – The top is filled with a blend of 10% down and 90% feathers, makes a very durable, quality bed, providing the “warmth” and feel of feathers at budget price.